We’d love your help. Let us know what’s wrong with this preview of Then There Were Nun by Dakota Cassidy. To ask other readers questions about Then There Were Nun, please sign up. “Sister” Trixie Lavender was excommunicated from the church after a demon possessed her. Coop the person responsible for saving her is in fact a demon. Coop is a talented tattoo artist, who escaped hell, and is desperately trying to acclimate to human life. Together with Coop’s trash talking owl, Livingston they move to small-town Oregon to open a tattoo parlor. This was fun from seeing them negotiate a rental agreement on the building they want to lease, to Coop dealing with all the complication “Sister” Trixie Lavender was excommunicated from the church after a demon possessed her. Coop the person responsible for saving her is in fact a demon. Coop is a talented tattoo artist, who escaped hell, and is desperately trying to acclimate to human life. Together with Coop’s trash talking owl, Livingston they move to small-town Oregon to open a tattoo parlor. This was fun from seeing them negotiate a rental agreement on the building they want to lease, to Coop dealing with all the complications of being human. In ink hasn’t even dried on the lease when the duo discover a dead body in their building. The dead body turns out to be their crooked landlord Crowley. The police clear Trixie and Coop but the list of suspects is impressive. Trixie got a taste for detective work when she was in Seattle and the two set out to investigate. The murder-mystery was well done with a few red herrings and twists to keep the reader guessing. The wrap us was clever. We meet new friends in Oregon, including another tattoo artist named Knuckles. Then there are locals, Higgs and his friend Jay who run the local homeless shelter. This was a fun cast of characters and I look forward to spending more time with them. As one would expect from Cassidy we get clichés, humor and twists a plenty with the murder investigation. We also get to see this duo establish roots in the community with a delightful thread involving Trixie as she befriends and helps others in the community. Hollie Jackson offered a fun narration and elevated the humor, snark and unique characters. A former nun and a demon open a tattoo parlor but when their landlord ends up dead in their new shop, it’s time for the detective hats to come out and solve The Who-done-it. It’s an irreverent and often funny read that is entertaining. In a G rated version which is unusual for this author. Trixie, the nun, is on a mission. Mostly just to support herself and her demon, but also now to solves murder mysteries and help friends and neighbors. Much of her language is straight from the most cliched stereo types but she is well meaning and loving so forgivable. Coop, the demon, trying hard to fit into society is adorable. A great start to a cozy mystery series. I look forward to the growing character base and finding out who the next one is to die and why the animals are talking. This is such a great start to a new series! The story quickly grabbed my attention and kept me turning the pages, I didn’t want to put the book down. The story is entertaining, and filled with a cast of quirky, and unique characters as well as a mystery that kept me guessing. I look forward to reading more in this series. “Then There Were Nun” is my first cozy from Dakota Cassidy, but I can tell you it won’t be my last! I have been a Dakota fan for years, but I stuck to her Accidental Series religiously, so when I saw she was venturing into the cozy mystery world I was a bit apprehensive, which I shouldn’t have been. I really enjoyed “Then There Were Nun”, the mystery was interesting, the world building intriguing and most of all, the characters were lovely. I cannot wait to read more of Trixie and co. This new series is a MUST read if you want a cozy mystery that keeps you not only guessing, but laughing the whole time. The first book in a new series I will definitely want to follow and can't wait for book two to come out! I never laughed so hard throughout the entire book. The main character, Sister Trixie Lavender and her demon in a human body, Coop are the most unlikely pair to be bonded together. Possessed, Sister Trixie has left the convent (she was excommunicated) when escaped demon, inc This new series is a MUST read if you want a cozy mystery that keeps you not only guessing, but laughing the whole time. Were were first introduced to these characters in the " Witchless in Seattle " series. "Sister" Trixie is just trying to make a living since she had been excommunicated. Coop is trying to fit in with the human, being a demon and all. A possessed former Nun, a Demon escaped from Hell, and a talking owl (yes!) move in to town and... Well. You're going to have to read the book to find out the rest! Spun-off from the Witchless in Seattle series, Dakota Cassidy writes another fun, slightly paranormal mystery. I love, love, love these characters, their names and EVERYTHING!!!! You can’t beat a series from Dakota Cassidy for the twists, turns, outrageous fun all with her imaginative world-building and clever dialogue. So, it was no hardship at all to start with this spin-off series featuring Sister Trixie Lavender, first met in Witchless in Seattle series. Much has happened to Trixie since then: excommunication, possession, finding a feisty owl named Livingston and opening a tattoo parlor with her bff-demon Coop – Hell’s best tattoo artist. But Trixie, despite having a life that has handed her plenty of lemons is optimistic and hysterically funny, until her landlord is found murdered in their new shop and while both Trixie and Coop have alibis, the list of suspects is long. And, then we have to account for Trixie and her rather ‘sitcom utterances’ that are so often cliché, but usually mostly appropriate and she’s such a darling that you can’t help but adore her. Not all is easy, since Coop the demon is interacting with humans and has to learn to assimilate and manage her hair-trigger temper, there’s a need to keep an eye on her – and laugh out loud with the mistakes made as she works to ‘pass’, even as they are covertly and overtly trying to discover who murdered the landlord. You can’t beat this for pure and unadulterated fun, with a solidly G rating as there are some things that this nun (excommunicated or not) just won’t do. It’s a twisty and laughter-filled road to the end with Livingston managing to steal the show occasionally as the story moves quickly through issues, investigation and solution – the perfect ‘escape from reality’ listen to brighten up your day. 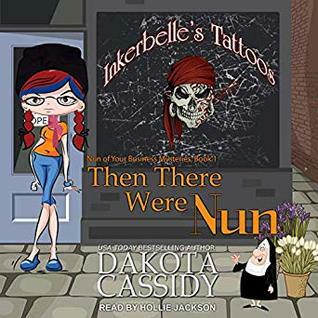 Narration for this story is provided by Hollie Jackson who has the most adorable voice for Trixie the grown yet still childlike nun, and she does a lovely job with adding just a touch of self-confident ditzy to her voicing. Coop, and Livingston are also clearly presented, and each additional character that we meet on the way, from Knuckles to Jay (and more) are all easy to recognize after first introduction. Jackson embodies this story in the performance, keeping listeners clued in and intrigued from first to last. Original story plot, that was nice, and the transition from a normal setting to the solving of the mystery was solid and seamless (rare nowadays). However, if you're going to start a new series, even if it's a break off from another series, still develop the actual characters personalities and give some back history to introduce said characters instead of continually referencing something in another book and series. I picked this book to read, not the other, and because of this lack in It's okay. Funny, with a truly unexpected culprit. I love that I truly had no idea who the culprit was. 100% in the dark. The story was humorous and entertaining, keeping my attention and interest squarely focused. What I disliked was the lack of good reason for Trixie to investigate. I felt like I was constantly asking myself “why”. Why did she feel so strongly about Higgs, why did she feel the need to question everyone? I also felt like I should have read the previous book Trixie was in. Maybe a note at Funny, with a truly unexpected culprit. A most enjoyable and original story! A possessed ex-nun, a demon and an owl purchase a tattoo shop sounds like the beginning of a bad joke yet it’s the start of a fantastic book. Trixie the ex-nun & her demon friend Coop are trying to find a home, set up a tattoo shop and fit into a community when murder strikes. They’re embroiled into an intriguing mystery when an ex-cop now a homeless shelter owner their new neighbor is accused of killing their landlord. This story is witty, fun Quirky fun! What a enjoyable and entertaining read. This fast paced story was filled with plenty of intrigue, humor, mystery, and suspense. I absolutely loved Coop she was hilarious. Overall a great read and great start for a new series looking forward to seeing what other shenanigans the Inkerbelle crew is going to get into. I voluntarily read and review this ARC no monetary compensation was received the opinions I have expressed are my own. This is an off shoot of the witchless in Seattle series. I would recommend the book they were introduced in, in the Witchless in Seattle series before you read this book. It will give you the background to this new series. I ready enjoyed the book with Trixie Lavender, an ex nun possessed by a demon. Coop is a Demond trying to learn how to be humans. They make you laugh in their trying to fit in. Then There Were Nun was a hard start for me. I found that the antics of Trixie and starting a new tattoo shop with all of the beginning descriptions had a hard time keeping my focus. Once I did get going in the story it was pure fun. It is a cozy mystery with a side of hooting paranormal. As a total side note, I was over endeared by the dedication. Dakota Cassidy is one of my very favorite authors. I liked this story a lot, the relationship between Coop & Trixie is cute. They have gathered a lot of sweet and interesting people into their group. I look forward to reading more stories about Trixie and hearing more about the evil being inside her. I haven't decided if I will continue the series. It was funny and predictable. I stopped reading a couple of times to look if I had started the series in the wrong order or missed another linked series that provided the back story to this book, since there were so many references to the past. I'm so please Trixie and Coop's characters have been given a life of their own, and a friendly place to live. Trixie might not be Stevie but she can get into as much trouble. I just hope Higgs and Knuckles are strong enough to help her out. New series with some characters from another series. Looking forward to more! Love Dakota Cassidy books! So happy that Trixie and Coop got their own series. As usual Dakota's books totally crack me up. The characters come from such oddball situations that they had to be lovable. Who else would think of this cast of characters. Looking forward to more adventures of Trixie and Coop. Dakota CAssidy is always an entertaining read! Very funny and such a quirky cast of characters! The mystery reminds me of the other series where we first meet the nun and daemon. I hope it becomes unique.